Long overdue breakout debut by New York trumpeter/composer and musician's musician Ron Horton, member of the Andrew Hill group and former member of the Jane Ira Bloom group. Full of hip, memorable, story-telling original tunes ranging from modal to "surf" to cinematic. Features Bloom and members of the Jazz Composers Collective. Play it, you'll like it. Buy Genius Envy now at the OmniTone store. 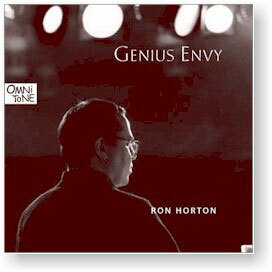 All compositions by Ron Horton, Ron Horton Music (BMI). Recorded 20 & 22 March 1999 at Acoustic Recording in Brooklyn, New York. Mixed and edited by Katsuhiko Naito at Current Sounds, New York.